It’s no secret I’ve been crushing on Deimos big time lately. I’ve truly rediscovered the joy of drawing this big purple guy! I just finished this illustration of him lifting weights, and it occurred to me that it would make a great promo poster for next year’s new Deimos anthology series, “Tales of the Taro Demon”. Each issue of “Tales of the Taro Demon” will contain up to three self-contained short stories featuring Deimos. Almost all of them will be written by me, and some will be illustrated by myself as well as other artists such as David Cantero, Alessio Slonimsky and Martin Chan, just to name a few. 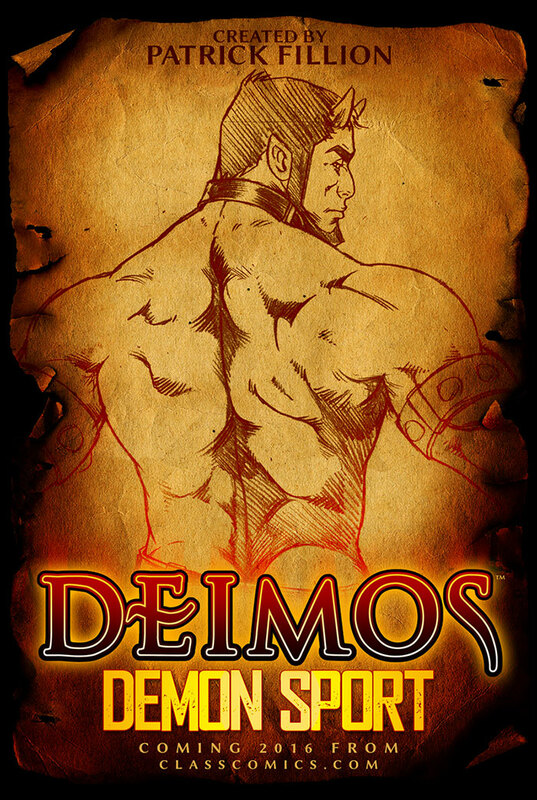 Since I can’t get enough of Deimos — and neither can his fans — this new title oughta make a lot of people pretty happy! DEIMOS: Tales of the Taro Demon, a new Anthology series featuring Deimos, coming 2016 from Class Comics. Illustration by Patrick Fillion. Colors by Cabrera and Fillion. One of the stories I’m personally cooking up for “Tales” is called “Demon Sport”. For fun I put together a little promo poster for that one too. I guess you can say that as much as 2015 was the year of Space Cadet, 2016 will be the year of the Taro Demon! DEIMOS: DEMON SPORT promo poster. Written and illustrated by Patrick Fillion. Coming 2016 from Class Comics. As for Deimos getting all sweaty working out, I had a lot of fun drawing this one. Hernán Cabrera and I did the final colors and, overall, I think the Taro Demon looks pretty inviting all pumped up like this. Ha Ha! Makes me even more excited about his up-coming spin-off series. Hope you enjoy this new illustration, and the news regarding “Tales of the Taro Demon”. Deimos Pumping Iron illustration by Patrick Fillion. Colors by Cabrera and Fillion. ← HALLOWEEN 2015! BARUND wallpaper! Cheers and thanks for writing! Even if the next Camili story is what makes me the most excited, every Deimos story is damn interesting as well, I`m very much looking forward to both! Thanks so much for the awesome comment and questions. I’m super happy to hear that you like both the “Sports” poster and the “Tales” one as well. I’m really excited about both of these projects and I have some really fun stuff planned for Deimos in 2016. Camili-Cat is comin’ back in 2016 too. I’ve decided to roll the “Bender” story into “Love Lost” #2. So all the pages I created for “Bender” are gonna end up in that book. “Love Lost” #2 will be th eofficial Cam and Locus story continuation, and is gonna merge both of their current story lines under 1 cohesive title. Should be lots of fun. I miss Cam and Locus too. So yeah — 2016… I’m making good progress, so I’ll keep you guys posted. Thanks again for taking the time to write. Happy New Year to ya! Thanks again so much for writing. Happy New Year to ya!